Practice Change: WOW, we all need to be doing this TODAY. What we do in the ED DOES matter and is linked to a HUGE mortality benefit. I will be using Fentanyl as the primary agent for pain control after intubation followed by low dose propofol and working to change our hospital’s sedated patient algorithm. Background: Delirium is know to cause increased mortality in the ICU. Deep sedation is thought to be a major contributor to the development of delirium. If patients lose day-night cues, their sleep architecture becomes disordered. If they lose their sleep architecture, they get delirious. If they get delirious, they have increased mortality. Patients: 251 Intubated Australian ICU patients from 25 centers. Patients still needed to be able to make EYE CONTACT TO A CONVERSATIONAL VOICE. 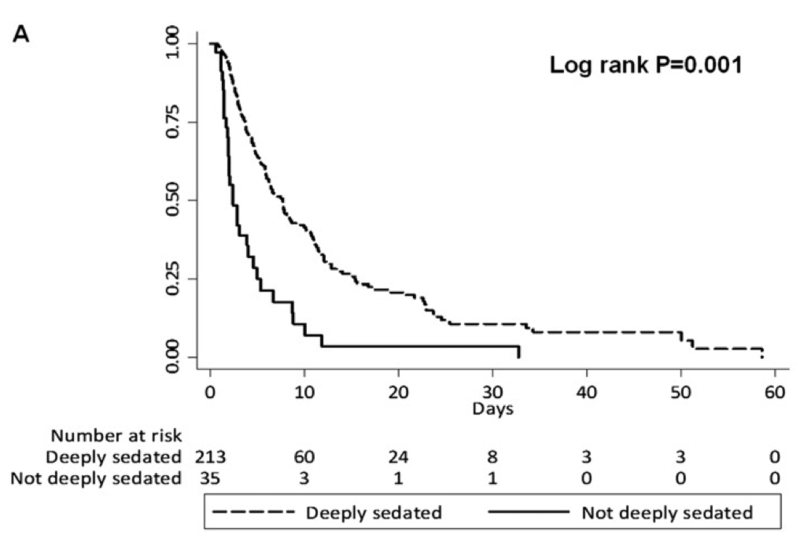 Conclusion: Deep sedation at ANY time increases Duration of Intubation and Mortality. This is the first paper to suggest that what we do in the ED DOES matter — if we sedate patients appropriately we can have a 10% mortality benefit for our patients. Is there a better way to do sedations so that we can keep patients from hitting those deep levels of sedation? 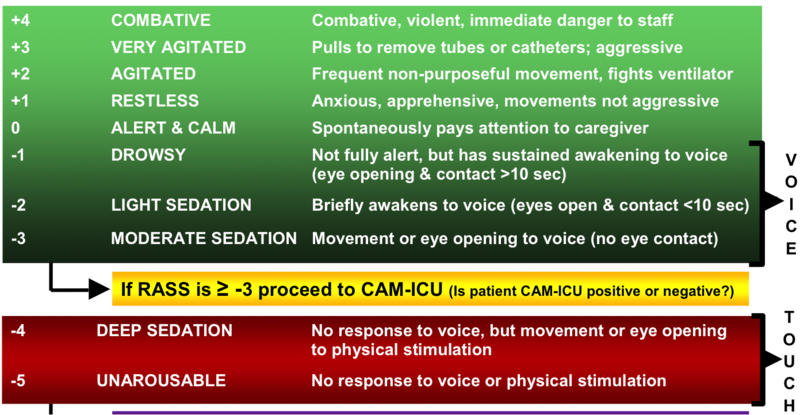 Yes, there is… and your ICU is likely already doing it… we just need to follow their lead. 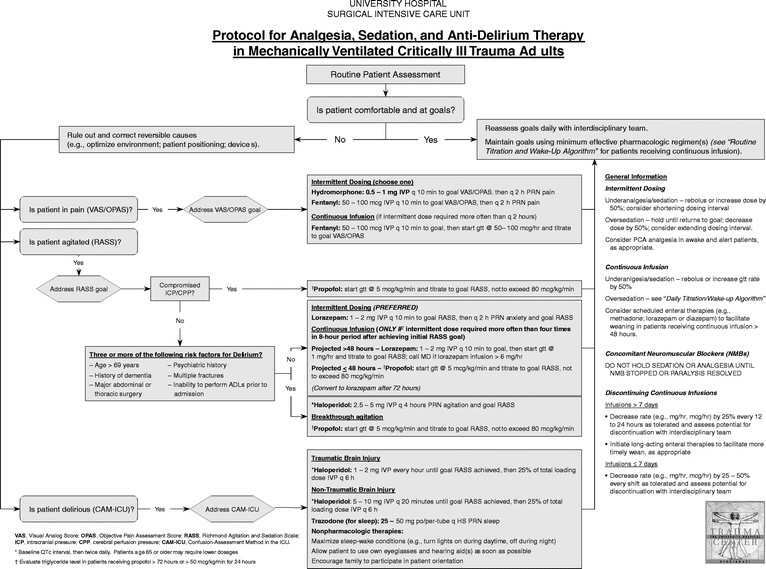 Society of Critical Care Medicine 2013 Sedation Guidelines — This is a long document, but one that has some very pertinent points for the state fo the art of sedation in the ER. i. We suggest that sedation strategies using nonbenzodiazepine sedatives (either propofol or dexmedetomidine) may be preferred over sedation with benzodiazepines (either midazolam or lorazepam) to improve clinical outcomes in mechanically ventilated adult ICU patients (Level +2B). Answer: We suggest that analgesia-first sedation be used in mechanically ventilated adult ICU patients (+2B). Four studies of 630 ICU patients shows decreased time to extubation in each study and shorter ICU Length of Stay. Conclusions: Sedating intubated patients to the point they don’t make eye contact with a conversational voice volume question (ie anyone on Versed or propofol only) is BAD for patients. ANY drop to this level (even in the ED) increases in hospital mortality by 10%. Use Fentanyl as your main sedative and propofol as an adjunct. Don’t use Benzodiazepines. Boluses of 50-100mcg of FENTANYL, until patient is comfortable. THEN use low dose propofol (5mcg/kg/hr) to get MILD sedation. To a max of 80 mcg/kg/hr. Fantastic Podcast of this topic on EMCrit: A New Paradigm for Post-Intubation Pain, Agitation, and Delirium. This entry was posted in *PRACTICE CHANGING, Critical Care and tagged A-1, Intubation, Sedation. Bookmark the permalink.